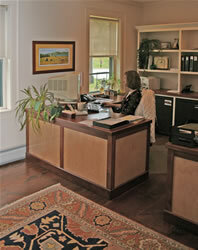 Vermont Woodland Cabinets designs furniture that is right for you. An office area can be efficiently tucked into a room in your home, or it can be a completely separate room set aside for the business and the pleasures of your life. The cabinetry finishes and personal design of office furniture enhances your home or business, and is a reflection of you. Your choice to work in a beautiful environment affects your image, your state of mind and your efficiency.